I am hoping if I show you pictures of what I have someone will know the pattern and give some direction. This one has a few complete blocks as shown. One long strip as shown 3.5" wide x 44" long. I have more fabric to finish this...but what is it and how do I do it? I know how to make the block...what is the long strip going to be? Small corner blocks maybe? Wow! I feel ya'. I received my mil's stash and ufo's at her passing. I have 5-6 of them I have been looking at off and on for 5 years trying to figure out what she meant for them to be. I actually just got one top done for a large king size bed. I just finally came up with my own plan that used all the pieces (almost) that she had. See if this tutorial will help you . 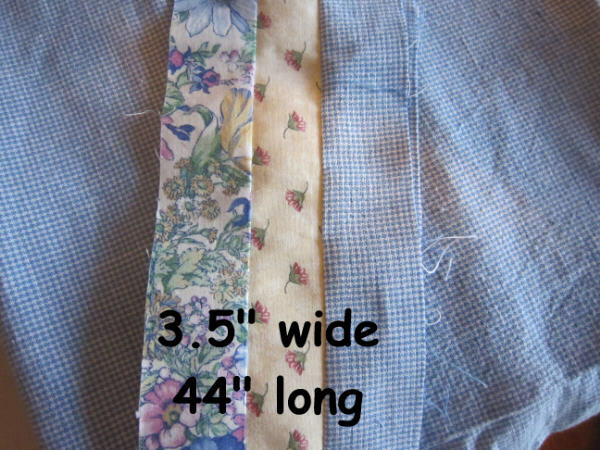 You need to cut the long strips up into smaller units and then rearrange them and sew them back together. It looks like it might be the pieced block for a double Irish Chain. The other block would be that floral with the light tiny floral appliqued to the corners. That is what I think also a Double Irish Chain. I went and got my Quilt in a Day Irish Chain book and it looks exactly like what is called Block A, Block B would have the floral as the middle sections and your white with print would be the corner stone blocks on that. I must not be seeing this...I kinda get how the long strip can turn into an irish chain, but how does the block fit? I will look at some of my books and see if I have any directions. I appreciate the insight...I would not have ever thought of this. Jan you always have such great diagrams to explain things! Thanks...but...what am I to do with that long strip in your plan? Jan, I love your computer skills. Where on earth did you learn how to do that? Love it! Jan, I may be going to have some free time, having a health problem. I may get a chance to sit and learn the type of things that you do. My, you are sharp! I think your strip may be incomplete or something. If you have enough fabric, just follow her directions to finish the quilt. Her values are placed differently so you will have to use your existing block as a guide for making the strips. Couldn't you just make more of the blocks and use the strips as borders? THank you Auntlucy....this make a lot more sense to me! I couldn't understand this part...Now I wonder if there is enough material to make a decent size quilt. I will look. If you don't have enough for a "decent size quilt" you could always make one the size you can, then enlarge it with borders of your choosing till you are happy with it's size. I've been watching a group that starts with a center square and then sends it around to each other and they each add a border and have been amazed at the wonderful results. Adding borders can be an amazing and artistic way to enlarge a quilt, whether starting with a block or one that is just a bit too small. Your strip set is for a second strip set with the colors opposite then cut to make a 9 patch. For your block you just need a 2 color strip set. That's what I see but I could be wrong. "Long strip in my plan"??? Not sure I understand what you mean. I'm assuming you mean the white strips - those between the darker blue squares on each side of the center square of BLOCK B. Those white strips are to be cut the same width as the blue strips that make up BLOCK A. Then they can be trimmed to fit each side of the center in BLOCK B. 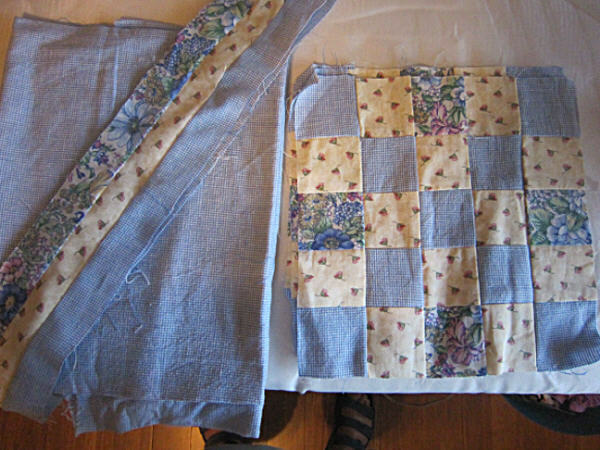 You will add a white strip to opposite sides of BLOCK B, then add a darker blue small square to the ends of 2 of those white strips that you will sew to the top and bottom side of each BLOCK B. It would show the block a little better if the colors on block B were reversed. 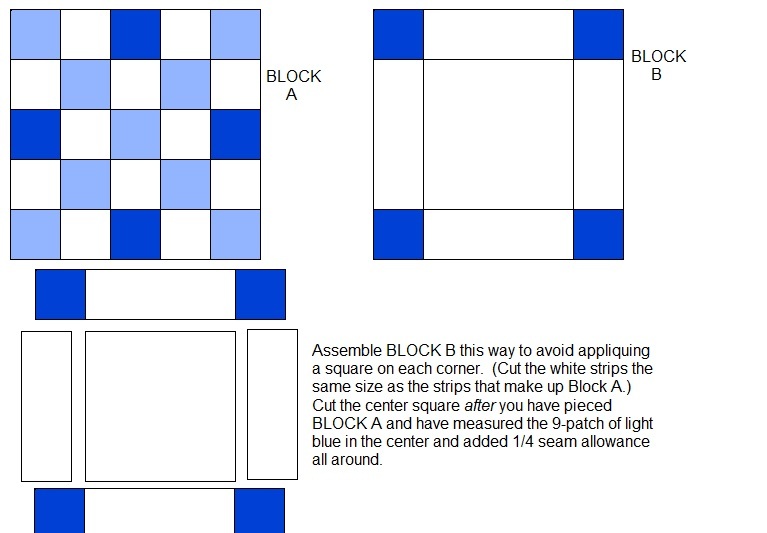 Block B is always the same fabric as the center square on each side of block A.
Jan.. I'm glad to see you are back at the computer... how is that shoulder... good to see you able to reply!! The strips are your small squares in the block, you just measure and cut across the strip.